Increasing affordable housing and creating community green space are both laudable goals to pursue in the ongoing evolution of NYC's neighborhoods, but a recent decision from city hall to invite developers to turn community gardens across the city into construction sites for new affordable housing seems to pit the two objectives against each other. Here in Bushwick, an online petition is going around to save El Garden, a new community garden that just opened last year at 120 Jefferson St., from this very fate. El Garden is situated on a lot owned by the city and managed by the NYC Department of Housing Preservation and Development, or HPD. DNAinfo reported last week that HPD is soliciting proposals from developers for nearly 180 public lots throughout the city, of which at least 15 are currently home to community gardens. The potential demolition of so many community gardens in the name of affordable housing has sparked a debate as whether it would actually be more valuable to NYC's communities for the gardens remain in place. "By developing this land, we will lose an extremely important asset to the community: a place where neighbors old and new learn and teach each other how to grow healthy food, develop knowledge and appreciation of the natural world, spend time just sitting or attending free cultural events, and offering free resources to Bushwick’s larger community (such as trees, food and soil)." That doesn't seem to be just high-minded rhetoric. Aside from gardening activities, El Garden has been home to BK ROT's compost bins since opening in April of last year. The Bushwick compost service employs local youth to pick up 2 tons of food waste each month from its subscribers and bring it to El Garden for composting. The petition also states that, in its short history, El Garden has "hosted the Green Guerrillas summer urban agriculture program in 2014, hosted an extremely successful NYRP Tree Giveaway (a part of the city's Million Trees Initiative), participated in the World Book Night book giveaway, and was a recipient of a Citizen's Committee Grant." While gardens operating on HPD sites are required to acknowledge that they have no permanent rights to use the land, critics of HPD's decision have questioned why it is targeting community gardens for redevelopment when HPD owns so many other vacant parcels of land that are currently not being used at all. 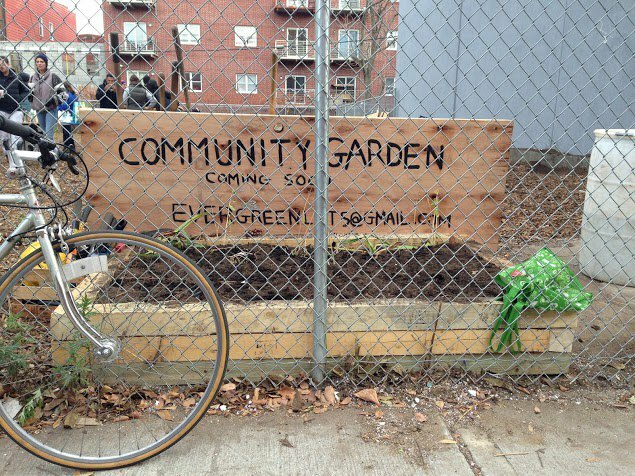 DNAinfo notes that among over 1,000 HPD sites, only 74 are in use as community gardens. The El Garden petition also challenges the notion that the new housing developments would truly be affordable. Indeed, Brownstoner reports that applicants earning up to 165% of area median income "($138,435 for a family of four)" would be eligible for any new rental units constructed under HPD's redevelopment plan. The El Garden petition will be sent to Mayor DeBlasio and Arielle Goldberg of HPD's Office of Neighborhood Strategies. We've received a tip that supporters of El Garden will also raise the issue at tonight's Community Board 4 meeting (6:00 p.m. at 195 Linden St.), and will keep you posted on how HPD's plan could impact El Garden and the Bushwick community as more details become available.